Picking the right diff ratio is an art where there are some real gains and a few pitfalls. Ultimately it makes up an important part of your car’s overall gearing and inevitably has a significant effect on its performance. 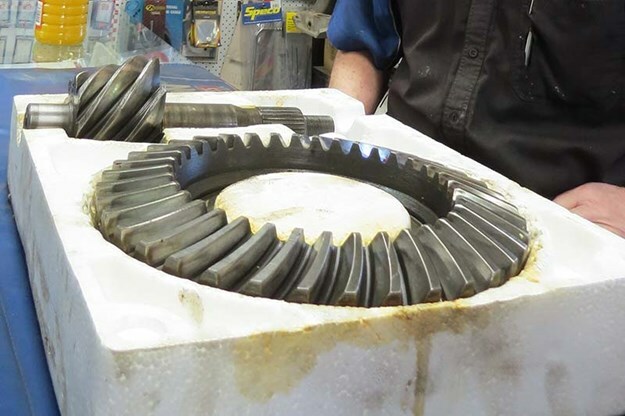 What we’re playing with here are the two fundamental components of a Ford 9-inch diff, which is one of the legendary units for the chrome bumper set. They are: the crown wheel (the big circular piece) and the pinion. 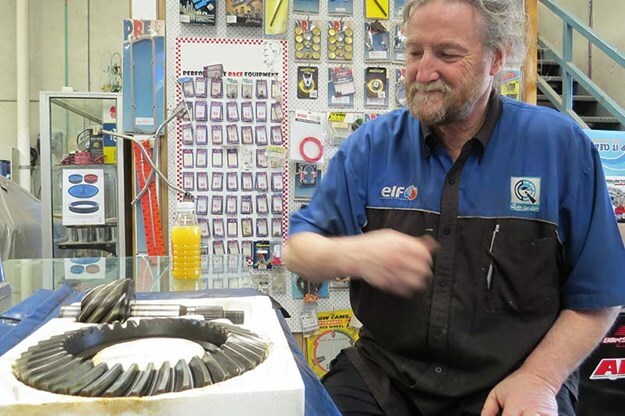 In this case they’re using curved helical-cut gears, which have the benefit of quiet running. 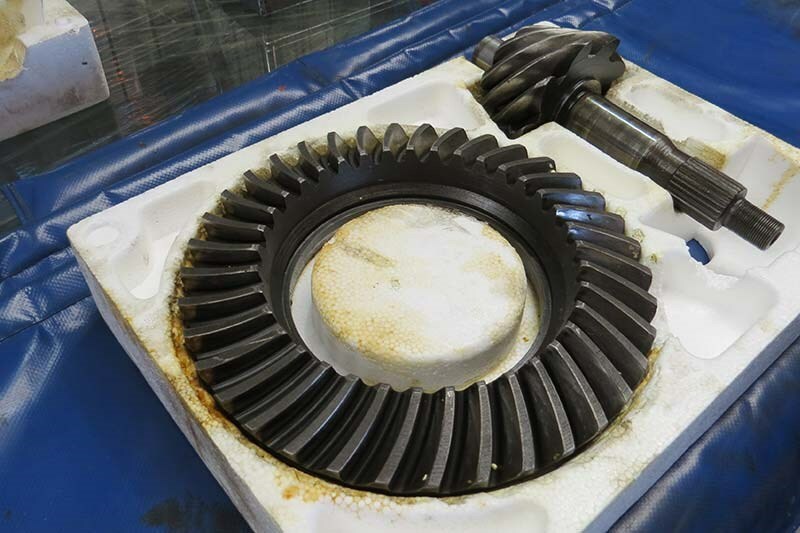 Straight-cut gears have some advantages in certain performance applications but tend to generate a lot more noise. One of the discussions you’ll get into when you’re building or modifying or even restoring a car is what diff ratio should you be using? Your starting point will be what’s in there already, which will have a stamping on the casing telling you what it is…sort of. The catch is these cars are at an age where they’re quite likely to have been rebuilt and modified a couple of times and what is on the casing may not reflect what’s actually inside. So to be sure, you need to check. You can of course open it up, but there is an easier way to check the actual gearing. Pop the car on a hoist and mark the driveshaft. Then turn the rear wheel one full revolution. If you’ve observed how many times the driveshaft has turned, that gives you the info to calculate the ratio. Fitting a crown wheel in your workshop isn’t rocket science but it has what’s called an interference fit. So while it’s bolted into place, it’s also pressed in tight. One option is to take the diff centre and put it in the freezer for 30-40 minutes while you do your prep. Meanwhile you’ll need to heat up the crown wheel either in an oven or with a flame. The idea is you’re shrinking the centre and expanding the crown – not by much, but it makes a difference. In theory, you should be able to literally drop the crown over the centre and then do up the bolts. Setting up the pinion can take some time. What you should have is a set of shims to adjust the fit – get new ones, if you can. You’re aiming to set up the mounting with a certain amount of preload, so the teeth on the gears get maximum engagement. We use bearing blue to see how the surfaces are mating, but a bit of grease can do the same thing. What you do is turn the pinion and look for the wear indications to see how much of the teeth are contacting. You’re aiming for a nice even pattern with maximum engagement. It can be a bit fiddly to get this right, but it’s worth the effort. If it’s too tight, you’ll feel it. If it’s too loose it will shudder Once the shims are set, there’s a given preload on the nut for the spline and the job’s done. When it comes to choosing the right ratio, you need to weigh up the engine, clutch, gearbox and intended use of the car. So a highway cruiser will want a tall ratio (smaller numbers) while a car that’s chasing acceleration will be looking for something shorter (higher numbers). As an example, your old 308 Statesman that’s built for highway use might be running a 2.78:1, so it’s got long legs and the engine is just ticking over at highway speeds. Now you might look at a similarly powered Monaro and it could be running a much ‘shorter’ 3.08:1 ratio to make it more lively off the line. Again, it’s not rocket surgery, but do make sure you’re getting advice from someone who knows what they’re talking about. Note: Mick runs Glenlyon Motors in Brunswick, Vic. Tel (03) 9380 5082.